Kelly Anne Brown, UCHRI’s assistant director, talks about her transition from graduate school to university administration. 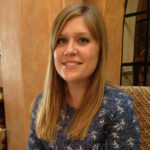 Elizabeth Allen received her PhD from the University of California, Santa Barbara in fall 2017. Her work centers on effecting culture change: facilitating dialogues where they are absent, cultivating greater communal self-awareness, and evaluating and strategizing how this change can be effected through actionable policy and practice.